I have been very slack on the blogging front and don't really have a good excuse. Now that my youngest child is at school I thought I might have more time to indulge in blogging, but it hasn't really worked out that way yet. I really don't know where the hours go (Ravelry, facebook and knitting probably). Recently I released two new patterns. It has been a little while since I felt very inspired with the designing business so it has been nice to feel creative again and to get some designs published. Sideline is a simple yet striking beanie pattern for the whole family. It uses a diagonal stitch I first started playing around with last year. It gives a squishy warm fabric that is perfect for a winter hat. The pattern is written in 6 sizes from NB to Adult for both DK and Worsted yarns. 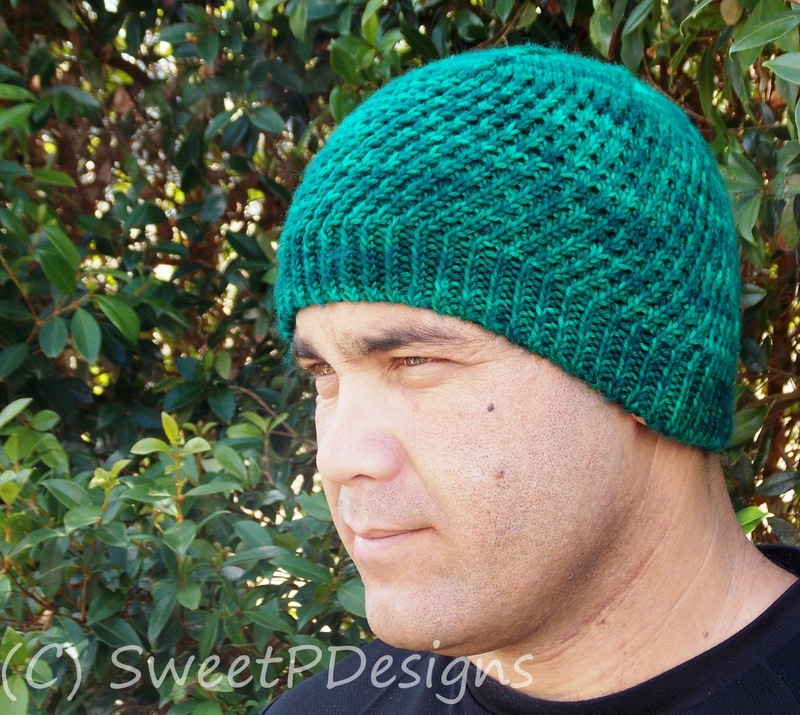 I really love this green one I made DH - he wears it all the time and there is no better compliment for a designer than her fussy husband wearing his hat all the time. After some deliberation I named it Sideline since the strong lines of the hat are the design feature and my prototypes had got plenty of wear on Saturday mornings at netball already. Sideline is available for $4US. My other pattern released today is also a hat pattern - this time a slouchy beret style. Hemlock has an interesting cable texture which is actually achieved with slipped and twisted stitches. No cabling required! I made a pink one for myself as the first prototype and get compliments on it every time I wear it. It's a pretty hat that is an easy knit and you can modify the amount of slouch to suit. Hemlock is available for $3US.